The best audiovisual installations come from SolucPro. In this case, we present a system to insert high quality images in the production of audiovisual programs, such as all kinds of news programs and even movies. This is Ultimatte 12, a digital composer suitable for the superimposing of high quality images and even elements of augmented reality. In addition, it allows generating the desired virtual scenarios; and all with the most advanced technology. To this day, the news should be primarily visual. Use the image to tell the news and in that way make them more attractive and dynamic. This becomes even more important when we talk about the world of television. That is why Ultimatte 12, with SDI 12G technology, is designed for all kinds of newsletters, not just news. Thanks to its ability to create scenarios is an ideal solution for sports news and, especially, for weather. Augmented reality is an idea that is increasingly being implemented with greater strength thanks to all its benefits. For example, anyone can interact with graphics and screens, something that would not be possible with a common composer. This allows creating news with greater interactivity and professionalism. Its revolutionary way of composition can give an authentic image of the whole environment. The person can glimpse while walking behind the objects and see their colours, which gives an unparalleled package of originality and professionalism in the world of augmented reality. Its benefits are not only applicable to the world of news. Given its full potential, it is an exceptional tool for creating virtual spaces in the film world. In this field of cinema, you can take advantage of its adaptable management. You will have a comfortable control from the touch screen, through a panel where you can manage up to 8 units, all connected in series. You also have buttons to save your settings and easily access all the parameters. Having one of the most powerful teams in the digital composition market seems fundamental. We live in times when technology advances rapidly, and it is increasingly necessary to be constantly updated. A digital composer updated and designed for the most powerful image production. 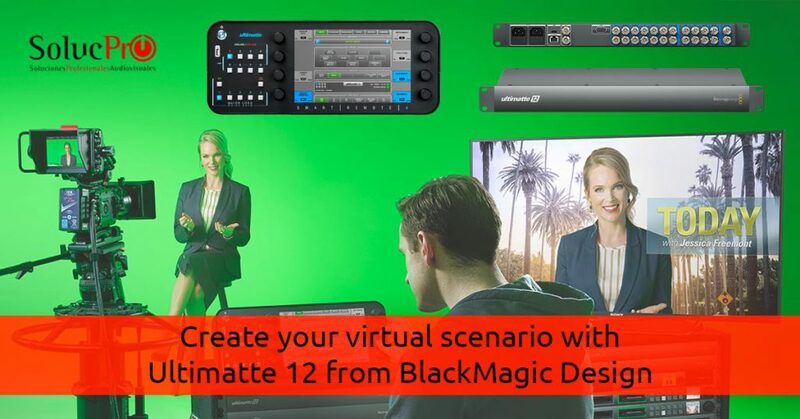 With Ultimatte 12 from Blackmagic Design, you can not only combine images in real time. In addition, you will have a renewed colorimetry and multiple advantages of composition and production, both adjustment and overlap. This digital composer grants some excellent competitive technical advantages for the superposition of layers. The algorithms, the fact of having a very large chromatic space and that the masks are generated automatically allows each image to be treated independently. We talk about aspects as substantial as the processing of reflections and edges (important to adjust details around the hair, for example) or the transition between colours. Not only does it reproduce the tonalities with absolute fidelity, but it also eliminates excesses of blue and green colour and allows work in dark areas and transparent objects. Trust us for any audiovisual material or project you have in mind. We offer you the best features.